This interview was done at New York Comic Con 2018 and has been lightly edited and condensed for clarity. We sat down with Mur Lafferty for a quick chat about Solo: A Star Wars Story, what it was like writing a film novelization, and the not-so-complex motivations of Han Solo. Keith Rice: Okay, so Solo: A Star Wars Story, was that your first novelization of a film? Mur Lafferty: Yes, yes it was. KR: What was the process like? ML: Well I was flown out to San Francisco to Lucasfilm, I had basically the day with the script and then I went home and started writing. I came up with a couple of additional scene ideas, and those had to be cleared through Lucasfilm. There was a delay on the deadline of the book which was great for me because I got to see the movie and was able to then tweak whatever I had gotten maybe a little wrong, which helped, because there were a couple of things I’d read in the script that I couldn’t quite picture. It was pretty amazing. KR: Can you talk a little bit about some of the new content you explored? 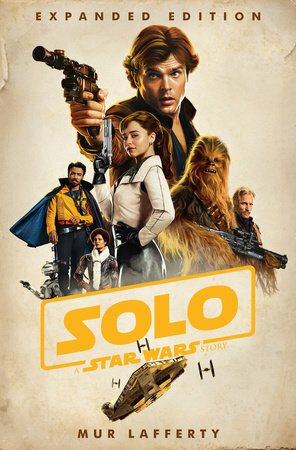 ML: (SPOILER ALERT – Skip this section if you haven’t seen “Solo”) The movie starts out with Han Solo running away from a deal gone bad. So, I decided I wanted to write that deal. Backup, say, fifteen minutes, and that’s when the story starts. We see Han Solo trying to cheat the people he’s selling the coaxium to so he can steal some of it for himself. Of course that goes very poorly and then he steals the speeder. I also expanded the scene of him at the academy, working with the Navy. And probably my favorite scene that I added was L3 merging with the Millennium Falcon from her point of view. Finally, I threw in this crazy idea to put an epilogue in there about what happened to all the coaxium they stole, where Enfys Nest took it, and Lucasfilm actually approved it, which shocked me to my core! I’m like, okay. I asked for all of this, all the toys in the world, and they delivered. KR: So, you added canon, basically. That’s amazing. ML: Yeah, so I got to write the epilogue with Saw Gerrera and Jyn and Enfys Nest. KR: What I does it feel like taking on an iconic characters like Hans Solo? ML: It was intimidating, but he’s – I mean, let’s be honest, he’s not a complicated character as an adult, and so he’s not a complicated character as a young man. He’s, you know… “I’m gonna try to ride my bike down this hill, okay the brakes failed, so lets make the best of it, and turn when we need to turn and okay, we’re going faster now, I just want to try not to crash.” I mean, that’s pretty much how he approached everything in his life. And so, just making that a little more naive and a little bit more willing—and removing some of the bitterness of his adult life—that’s how I wrote it. KR: How do you find a balance between your podcasting and your writing? ML: I usually do not podcast as much as I intend to. So, writing is the priority. And luckily because the shows are about writing, my listeners understand. Because when I tell them I actually have a book due and podcasts aren’t going to be coming as often, they understand because they’re writers, or they want to be. Honestly, podcasting doesn’t take that much time. It’s all the other things, procrastination, or the things that demand you time from home, or deciding that ten minor emails are more important that your daily writing or something. That’s what I struggle with. It’s not a time thing, it’s a priorities thing. If I can dedicate an hour or two hours a week to podcasting I’d be fine. It’s just finding those two hours among the maelstrom of procrastination and stuff that is my constant struggle. KR: If you could take on another Star Wars character, who would you want to write? ML: Completely different from Solo? Gosh, so many. KR: Who’s your top three? ML: I really want to write some young Finn stories. I want to know, I mean, something had to happen in his youth that gave that spark of, “I got to get out of here,” kind of thing. Gosh, I don’t know. Everyone I think of has already been done by very good authors, and, you know, Leia’s one of my favorite characters of all time but there’s been a lot of stuff told about her. ML: I guess I’m just going towards the newer ones. I have to say, Enfys Nest, I love her. I think that there are so many stories you can tell about her. And I think are a lot of stories you could tell about Qi’ra, after she went to take on the Crimson Dawn. I think a lot of people – I’m going on a tangent here – I think a lot of people were very confused by Qi’ra’s actions. I heard somebody say she was betraying Han. And I didn’t see that at all. She never ever, ever, said she would go with him. She never promised anything. He just assumed and went off on his own little fantasy world. But I would love to follow her and see a little bit more of her reasoning behind things. I guess my top three would be Enfys Nest, Qi’ra and Finn. 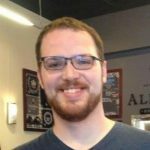 KR: What’s your current favorite podcast? ML: I’m not listening to podcasts right now. I feel awful, I feel awful. ML: There’s so many amazing podcasts I hear about now, but I usually use my audio time to listen to books. KR: How about this. If you had to pick a podcast to introduce someone to podcasts, what would you recommend? ML: Let’s see. A friend of mine, Rob Walsh, who now works at Libsyn, Liberated Syndication, one of the first podcast hosts, he did a podcasts called podCast 411, where he’d talk about all the news in podcasting. And that was pretty cool to watch. For children’s podcasting one of the first people who did that was Grant Baciocco, was Radio Adventures of Dr. Floyd. He took, just, a very small scripted radio show-type format and made it for kids. It was very funny and really clever. Gosh, and you know for fiction, Scott Sigler I believe is still doing a lot of fiction and a lot of keeping up with everything. He’s putting out a lot of content as well as his books. Check out Mur Lafferty’s Solo! Happy May 4th! Today let’s celebrate Star Wars by going further into the universe and reading. Check out our Star Wars page here and browse below for some selected books to add to your to-be-read list. These are just a few of our Star Wars books – check out the page to find more. Star Wars: The Force Awakens is opening in theaters on December 18th, and everyone’s talking about it. To celebrate, we made a whole Star Wars page! You can browse through your favorite series, find kids books for the younger fans, and find new ones to tide you over before the movie. For the Star Wars lover in your life, check out our gift list here. And last but not least, you can enter for a chance to win several Star Wars kids! Enter here!